An estimated 3.3 million Americans are injured on the job every year. The pain and disability of work injuries not only result in lost productivity and missed work time, they can significantly affect an employee's career and personal life. Work injuries can generally be categorized into two types: 1) those that occurred as a result of a specific traumatic incident (such as a fall or heavy lifting); 2) or those that developed over time due overuse injuries, poor posture, or performing the same motions day in and day out (repetitive strain injuries). While the former may be more dramatic, the latter can be equally debilitating. Ignoring your symptoms will simply result in greater injury and the potential for chronic pain, so it's important to consult with your Henderson chiropractor sooner rather than later. How Can Your Henderson Chiropractor Help with Work Injury? Seeking the care of your Henderson chiropractor can expedite your recovery and lower your risk of developing chronic pain after work injury. Countless medical studies have demonstrated the effectiveness of chiropractic care for a number of work injuries such as back pain, neck pain, headache, pinched nerves, carpal tunnel syndrome, herniated discs, sciatica, and more. In fact, employees with neck and back pain who see a chiropractor tend to miss fewer work days on average compared to workers not under chiropractic care. For instance, one study showed that chiropractic patients with sciatica had 71% fewer missed work days compared to patients not treated by a chiropractor. So why do employees under chiropractic care often return to work sooner? 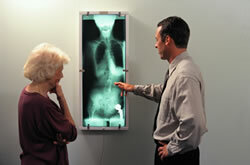 The answer lies in the noninvasive, no-nonsense approach of chiropractic care. Often medical treatment for work injuries consists of anti-inflammatory drugs, pain medications, and sometimes surgery. Drugs such as ibuprofen or epidural steroid injections can decrease pain for the time being, but the underlying problem persists, dragging on your recovery time from work injury. Chiropractic care, physiotherapy, and massage therapy can offer natural pain relief while actually addressing the cause of your work injury. Although surgery may be necessary in some cases, it requires patients to take off substantial time from work for recovery. Many patients with disc herniation, sciatica, or back pain can actually recover without surgery by using noninvasive treatments like chiropractic, physiotherapy, and massage therapy. In many cases, the noninvasive nature of these therapies can heal any injured tissues, ligaments, and discs while you maintain your work responsibilities. If your work injury is more severe you may still require time off or more invasive procedures, but our Henderson chiropractors will strive to get you back to working without pain as safely and as efficiently as possible. Don't let work injury get in your way of working and living life to the fullest. Contact Advance Spine & Rehabilitation for relief from work injury in Las Vegas and Henderson, NV today.